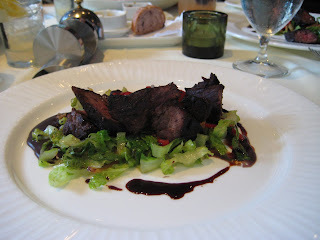 Last night, Wendy, Ashley, Wendy's co-worker Amy, and I went to dinner at Equinox for Restaurant Week. After an awesome meal at Rasika, I was looking forward to this dinner. I have heard the name Equinox quite a bit, and my expectations were high. When we came to the front door, Celine Dion - it's All Coming Back To Me Now started playing in my head. Why? Because I have actually eaten at Eqinox a few years ago with Alyssa, and the experience was rather lackluster. Alas, nothing has changed much. Okay, and now to the food. 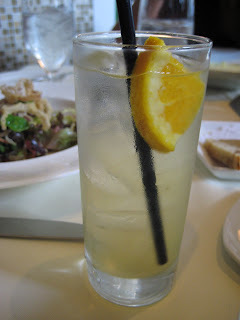 Equinox offered 2 specialty drinks for Restaurant Week Menu. 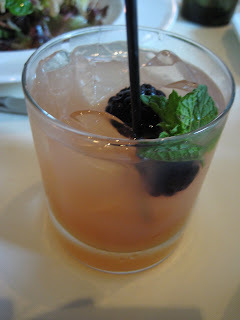 Wendy chose Garden Blackberry "Margarita": omg, it was super strong, but pretty good. 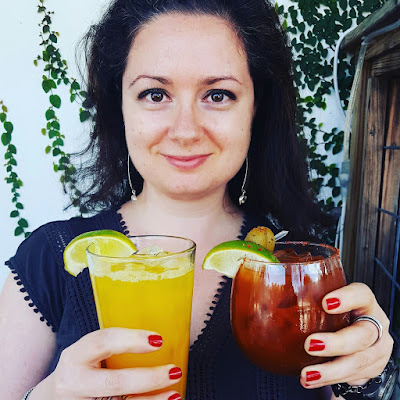 Amy and I chose Sangria "Blanco"--pretty refreshing, but did not give me a buzz (and it does not take a lot for me to get a buzz). 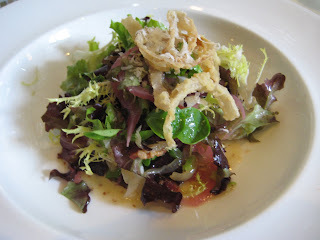 Wendy's appetizer: Three onion salad with aged sherry vinaigrette (mache lettuce, crisply shallots and smoked applewood bacon): it just looked like a salad with some fried onions on top. 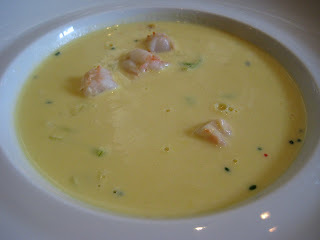 Ashley, Amy and I chose Creamy Rappahannock corn chowder with Gulf shrimp (foundued leeks, roasted sweet corn and lobster roe): this was a pretty delicious and rich soup. I can't remember tasting any lobster roe though. And my biggest pet peeve: the potatoes were under cooked!!! 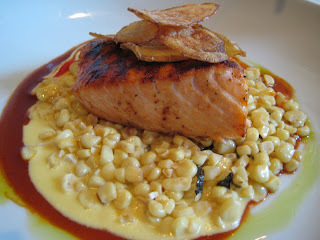 For the main course, Amy and I chose BBQ'd Scottish salmon with summer corn (backyard basil, fingerling chips and sweet corn): the salmon was cooked perfectly, the corn was sweet, and the sauce was lovely. The fingerling potato chips? I think there might have been five...I wanted more! 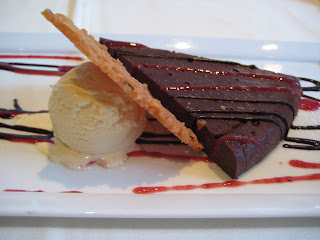 Everyone, but Wendy, chose semi-sweet chocolate truffle cake with lavender gelato and citrus tuille: the cake was awesome! Rich, smooth, and definitely filling. The gelato wasn't my cup of tea, but I still ate it. 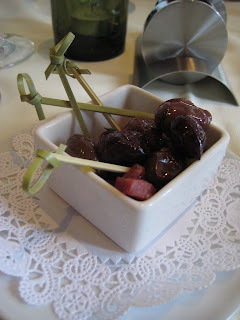 The citrus flavor was completely amiss in the tuille. 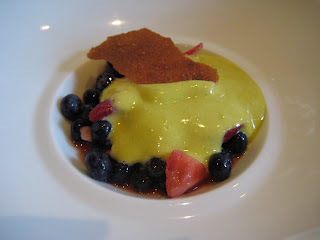 Wendy's dessert was marinated blueberries and strawberries served with pistachio zabaglione and pistachio crisp. She was underwhelmed by the concoction. Final thoughts: this was a good meal, but nothing note-worthy, and definitely a let down for such a well-known restaurant and chef. Don't think I'll be back (unless, once again I forget that I've already dined there). Now I'm tempted to go to another dinner to end this Restaurant Week on a high note.